BIG ARBOR VITAE LAKE IS 1,070 ACRES WITH MILES OF UNDEVELOPED SHORELINE OWNED BY THE STATE OF WISCONSIN, AND IT'S THE SETTING FOR THE NEWLY CONSTRUCTED HIGHLAND VIEW CONDOMINIUM. FEATURING 309 FEET OF EXCELLENT SWIMMING FRONTAGE THAT IS VERY LEVEL AND SANDY.. IT OFFERS 2,400 SQUARE FEET OF HIGH-END FINISHES INCLUDING QUARTZ COUNTERTOPS, HARDWOOD FLOORS, A STACKED STONE FIREPLACE AND MUCH MORE. THERE ARE 3BR, 3BA, A LOFT AND A 3-SEASON PORCH OFF THE MASTER. EACH UNIT ALSO COMES WITH A 2-CAR ATTACHED GARAGE, AS WELL AS A 12X24 DETACHED GARAGE; BOTH WITH 8 FOOT DOORS FOR EASY BOAT OR TOY STORAGE. 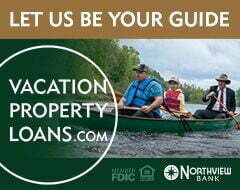 ADDITIONALLY, THE PROPERTY COMES WITH A DEEDED BOAT SLIP, NATURAL GAS AND HIGH SPEED INTERNET, WHICH IS A STRUGGLE IN THE NORTHWOODS. START ENJOYING THE NORTHWOODS FROM THE COMFORT OF YOUR OWN CONDO CONVENIENTLY LOCATED IN ARBOR VITAE! Exterior Features: Pier/Dock,Boat Slip,Patio,In-Ground Sprinkler Sys.